Product information "Orexin Receptor 1 STEP(TM) Reporter Assay Kit (Luminescence)"
Surface Transfection and Expression Protocol (STEP(TM)) is a novel, patented, solid phase transient transfection technology that overcomes many of the disadvantages of other transfection approaches. CaymansOrexin 1 Receptor (OX1R) STEP(TM) Reporter Assay Kit (Luminescence) consists of a 96-well plate coated with both OX1R and Secretory Alkaline Phosphatase (SEAP) reporter constructs (OX1R STEP(TM) Plate). Cells grown on the STEP(TM) complex will express OX1R at the cell surface. Binding of agonists to OX1R initiates a signal transduction cascade resulting in expression of SEAP which is secreted into the cell culture medium. Aliquots of culture medium are removed at time intervals beginning at about 24 hours and SEAP activity is measured following addition of a luminescence-based alkaline phosphatase substrate provided in the kit. The kit is easy to use and can be easily adapted to high throughput screening for therapeutic compounds regulating activation of OX1R. A known OX1R agonist, Orexin-A, is included in the kit for use as a positive control. The kit provides sufficient reagent to measure SEAP activity at three time points, using the black plates provided. 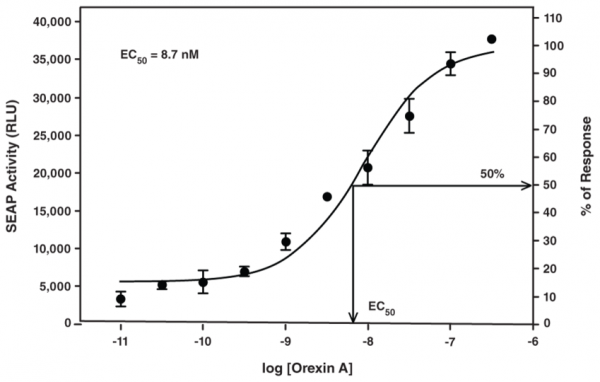 Customer review for "Orexin Receptor 1 STEP(TM) Reporter Assay Kit (Luminescence)"